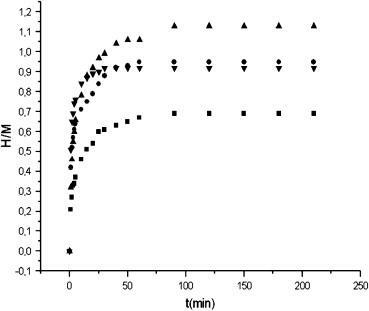 Principle: Measuring of hydrogen pressure drop due to absorption of hydrogen in sample. Equipment (self-constructed): Quartz tube containing a weighed quantity of sample powder, thermostated at a given temperature using a tube furnace. Connection with vacuum and hydrogen reservoir is realized using a set of valves. Performance: working pressure: 1 bar; temperature range: 300-1000K; maximal measurable pressure change in the system (due to gas absorption in sample): (100.00 ± 0.01) mbar. Hydriding kinetics: Based on measured H/M change during time, kinetic parameters are determined. Some examples are given in references below. The use of the equipment is free of charge, but it requires the presence of an authorized scientist. All participants must apply for user time in advance. 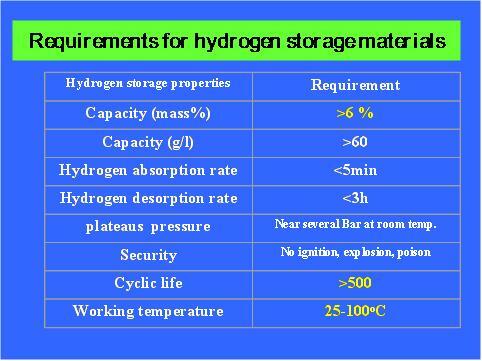 International Journal of Hydrogen Energy, 34 (2009) 3764-3770. The hydrogen absorption isotherms of Hf2Ni at various temperatures: ■ 300 °C, ● 400 °C, up triangle, filled 450 °C, and down triangle, filled 550 °C. Journal of Power Sources, 193 (2009) 165–169. 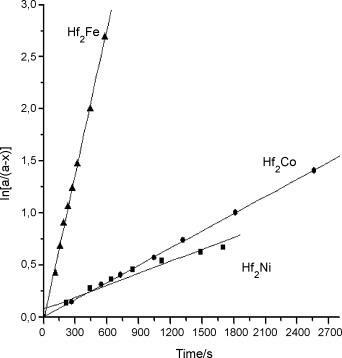 The dependence of ln[a/(a − x)] vs. time at 573 K; a is equilibrium (maximum) amount of H/M (hydrogen atoms absorbed per one molecule of alloy) and x is H/M for time t.
3. Conić, D., Gradišek, A., Radaković, J., Iordoc, M., Mirković, M., Čebela, M., Batalović, K.